Nearly 25,000 Eritreans made that journey since the Lampedusa disaster and in July alone 5 boats went missing three of them resulted in fatalities. that for Eritreans? According to UNHCR 4,000 refugees are leaving their country every month. IT IS NOT DIFFICULT TO IMAGINE THE TOTAL DESOLATION OF ERITREA! 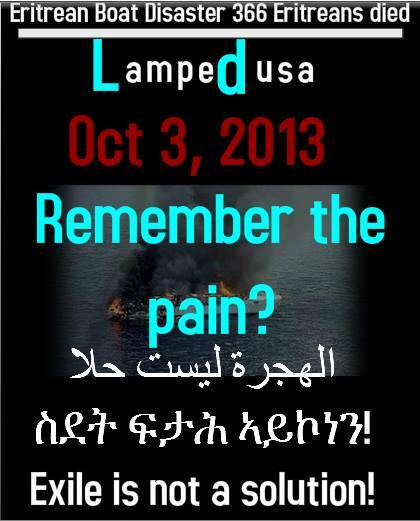 Arbi Harnet (Freedom Friday) is looking for partners in this campaign that we will launch on the 3rd of October as we mark the first anniversary of the Lampedusa Disaster. •Make robocalls calling young people to not choose exile as a solution to dictatorship and encourage them to fight back instead. And we are inviting you to partner with us to maximize the effect. If you have any other ideas, please do share with us and we will be happy to support implementation. This is an Eritrean pain that will take all of us to heal. Stop spreading hopelessness… mind your business. ኤርትራውነት has never being a problem, it’s the ‘rootlessness’ of some of you that is bleeding us. should be made aware of this individual playing double standards. He has the audacity to keep accusing others as well, what a hypocrite indeed!